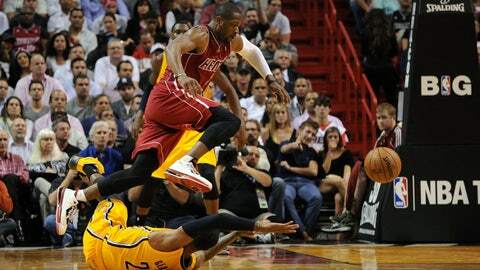 Dwyane Wade, who led the Heat with 32 points, leaps over Pacers forward Paul George. MIAMI — The Miami Heat tried to convince everyone Wednesday night’s game against the Indiana Pacers was just another regular-season game. The Heat roared back after trailing by as many as 15 points in the third quarter to earn a 97-94 victory against the Pacers at AmericanAirlines Arena in a battle between the Eastern Conference’s two top teams. Dwyane Wade scored a game-high 32 points. LeBron James (24 points, nine rebounds, seven assists) showed little effects of a twisted ankle suffered two nights earlier. Indiana center Roy Hibbert (six points) was limited to fewer than 23 minutes due to foul trouble. Although Miami outscored Indiana 50-30 in the paint and 21-9 in fastbreak points, pathetic 3-point shooting (5 of 21) nearly cost the Heat. It was the teams’ second meeting in nine days. The Heat lost at Indiana 90-84 on Dec. 10. The Heat (19-6) trail the Pacers (20-5) by a game in the race for home-court advantage throughout the conference playoffs. The teams don’t meet again until March 26 at Indiana. They’ll play again at Miami on April 11. Hibbert left the game after getting his fifth foul with 8:34 to go in the third quarter. Bosh’s two free throws made it 58-49, but a 12-foot jumper by David West and Paul George’s 3-point gave Indiana its biggest lead to that point, 63-49. Norris Cole and Rashard Lewis each hit a 3-pointer — the team’s first treys after going 0-for-9 — to start a 13-4 spurt that pulled Miami within 76-71 after three quarters. The Heat had trailed by as many as 15 in the third. Indiana led 52-41 at halftime Miami missed all eight first-half attempts behind the arc. Foul trouble limited Pacers center Hibbert to 13:17. James had 8 points in the second quarter despite exiting with 4:26 to go after picking up his third foul. The Pacers immediately went on an 8-2 run after James sat to go ahead 48-37. Things got an little testy with 6:52 left in the half when Udonis Haslem was called for a foul and Mario Chalmers and Indiana’s Lance Stephenson were given technical fouls. The Heat trailed the Pacers 26-22 after one quarter. Miami led with points in the paint (20-12) but shot 0 of 5 from 3-point territory and was outrebounded 13-7. Behind 90-82 with 3:51 left in the fourth, the Heat closed the game with a 15-4 run using a lineup that included Chris Bosh playing with Chris Andersen up front, and LeBron James running the offense. Wade, who scored five straight points to jump start Miami’s closing run. Roy Hibbert’s line: six points, two rebounds, five fouls, 22:55 of playing time. The Heat continue their 5-game homestand against the Sacramento Kings on Friday night, 7:30 p.m.